Before You Hire a home inspector you should know who you are hiring. You will want a properly trained, certified, experienced and insured home inspector who will strictly follow the industry standards. How to verify a home inspector? (Click on the highlighted links). The most important thing you should do before you buy or sell a home is to have the home inspected! Home inspection is one of the most important aspects of the home buying process for both the buyer (helping them understand the condition of the house they’re considering purchasing) and the seller, who wants to provide adequate disclosure regarding the home they’re selling. A home inspection will give you the security and peace of mind to assist you in a fair and smooth transaction. Avoid the “I should have…” or “…wish I would have…” statements that so many people make after buying their home. The inspection report written up by the home inspector after the inspection is the only document that details the house, making it an important aspect of the real estate transaction process. Your inspection is an in-depth visual examination of the structure and operating components of the home performed by Jamie or Mari Jo, a trained professional. A home inspection includes an examination of the heating and central air conditioning systems, electrical systems, interior plumbing, the roof and foundations, attic and basements, visible insulation, walls and ceilings, floors and windows and major appliances. The typical cost of an inspection varies depending on the type of residence (single family house, condo or multi-unit), size of the home, and services the inspector is providing. Provide a move in ready home, it’s good idea to have an inspection done before you put your home on the market. This will help you avoid any surprises when potential buyers hire a home inspector. After the report from the home inspection, you may choose to have the recommended repairs taken care of by the contractor of your choice, or you may choose to disclose the conditions you are not going to repair, which will protect you from liability of nondisclosure claims. If you’re buying a home, be present for the home inspection, minimally towards the end. We will be able to answer any questions you may have about maintenance of the house and will be able to discuss any potential problems. If we find any major problems, you’ll need to negotiate with the seller to either lower the price of the home or have the seller repair the problem. If the seller is not willing to renegotiate, the buyer will then have the opportunity to rescind their offer. 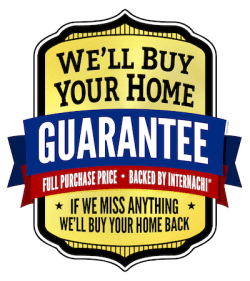 Click on the we’ll buy your home guarantee logo for information on the Internachi® buy back offer. Our inspections are performed following the standards of practice set forth by both International Association of Certified Home Inspectors (InterNACHI®) & the American Society of Home Inspectors (ASHI®). Computer generated reports include digital pictures, are easy to read, clearly address concerns and include a summary which cross references the recommended repairs by specific trade. 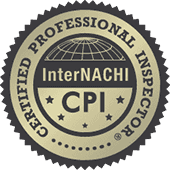 We are certified, fully insured, experienced and members in good standing of both the International Association of Certified Home Inspectors (InterNACHI®) & the American Society of Home Inspectors (ASHI®).